Keeping hydrated is incredibly important. This is especially true if you are doing heavy exercise, such as cycling. In fact, around 60 percent of our body mass is water. When you sweat you dehydrate quickly, which worsens your performance both physically and mentally. Therefore, if you are planning on cycling more than a little distance, you are going to want to bring a water bottle with you. A bottle cage is an easy way of bringing your bottle along on a ride without having to hold it the whole way. This article aims to review 6 of the best bottle cages. After reading the article, you ought to have a better idea which bottle cage is best for you. There are several factors to consider when choosing the best water bottle holder for bikes. The first factor to consider is how well the cage holds the bottle. This must be as secure as possible, especially if you are riding over difficult and unpaved road surfaces. Some newer cages use the spring in their design to hold in the bottle, while some older fashioned ones use a more secure fastened grip. A good quality bottle cage may have rubber inserts too, to aid in gripping the bottle. Next, consider the ease of access to the bottle. You don’t want to be fumbling around, struggling to get the bottle free while you are riding. Racing cages may favour ease of access to security. Others may allow access to the bottle from multiple angles to make it easier. Weight is the next consideration. If you are a racing cyclist then you will be serious about keeping weight off your bike. There are cages with a deliberately minimalist design in order to save those precious grams of weight. Carbon fiber is especially light. Finally, consider the size of the cage. Some cages have slots for multiple bottles, allowing you to stay especially hydrated. Others only allow a single small bottle. Many cages are now also flexible, with moveable rubber stoppers allowing you to fit any size or shape of water bottle. This Ibera water bottle cage is built to be as lightweight as possible. Indeed, it weighs only 43 grams, which makes it ideal for race cyclists, or those who just prefer a lighter bike. Reviewers felt that it did an effective job at keeping bottles locked in tightly. It is described as fitting most regular and over sized bottles, but many reviewers described it fitting smaller bottles too. It attaches to the bike using two bolts, which connect to the bike frame. Reviewers note that it may not be suitable for off road use, which may make it unsuitable for some. They were also pleased with how easily the bike bottle could be accessed and reinserted. Click here for reviews, prices and pictures on Amazon. This is one of the lowest priced bottle cages on the market, at only £4. However, many reviewers were impressed by how well the cage performed for its price. This bottle cage is made from thermoplastic resin, which provides a light spring. Many users thought that the cage made the water bottle easy to use and access. Bottles can be entered into the cage from above or the side, providing flexibility while riding. At only 46 grams, this is a very light weight bottle cage, so would be suitable for a race rider. However, this cage is possibly not suitable for an off road rider. It attaches to the bike with bolts, although these are not supplied with the cage. This was noted with displeasure by many of the reviewers. They were pleased, however, with how well the bottle cage adjusted to allow all kinds of bottle sizes to remain in place. This bottle cage is one of the sturdiest on the list, being built from an aluminium alloy. The aluminium alloy gives the cage extra strength, allowing it to stand up to knocks and bumps. However, the design means that bottles may come loose on bumpy roads, making this cage perhaps best suited to road cycling. The sturdiness of the cage comes at a slightly greater weight of 60g, meaning these are perhaps not meant for race cycling. Reviewers were impressed by the value for money of this cage. At £10 for two cages, this is one of the best value cages for a regular, every day cyclist. It is connected to the bike via heavy duty bolts, which are provided with the cage. The cage fits larger bottles well, and reviewers were impressed by how well even very large bottles stayed in place. However, they were less impressed with small bottles, which struggled to stay in the cage. This Pro-Bike Tool water bottle holder is the joint most expensive on this list, at around £13. Therefore, you would hope that this was the highest quality bike cage on the list too. Reviewers would tend to agree. They were near universally impressed with the build quality of the bottle cage. Particularly praised was the aluminium alloy construction. Reviewers noted that it was easy to insert and remove the water bottle, with access possible from several angles. This made it easy to ride and hydrate without fiddling. They were also pleased with the rubber inserts, which made sure that the water bottle was always securely fastened, and prevented vibration. The cage fits almost all kinds of bottle sizes, due to the adjustable design. This is a very traditionally designed bike bottle cage, with the advantages and disadvantages that you would expect from that. It is a stiff metal cage, which comes in only one colour – black. They are sturdy, if a little inflexible. Reviewers were impressed by how well the cage stood up to knocks and damage, although the minimal frame did little to prevent mud flirting up from the ground onto the bottle. Reviewers did note that the cage was easy to clean though. The bottle cage is attached to the bike with a bolt, although reviewers were split over whether they received the bolts with the cage or not. It is a suitable cage for larger bottles, if not particularly small ones. Due to its sturdiness, this might be a suitable cage for an off road cyclist, or anyone whose bikes is likely to take knocks. This is a low cost cage, at only £5, so it would also be a good budget option. This is the only carbon fibre cage on the list, and is by far the lightest. At only 24g, this cage is incredibly light, and would therefore be very suitable for race cyclists, or those who prioritise light weight cages. 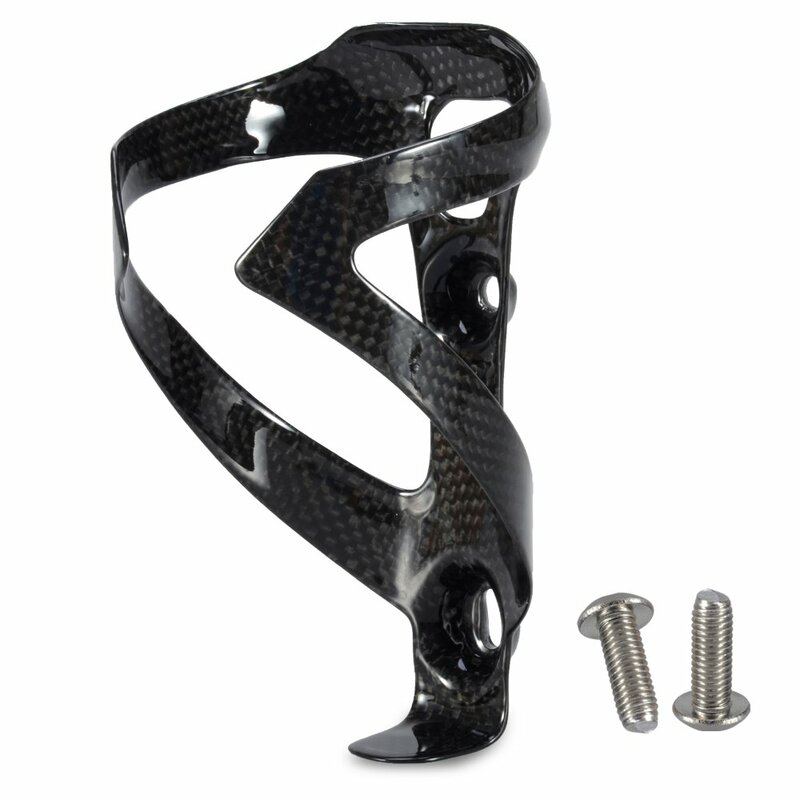 Carbon Fibre cages are, as well as being light weight, very strong. This is one of the most stylish cages on the list, which would suit those who prioritise the look of their bike. It is unbranded, and comes in a shiny black design. This cage has been described by its reviewers as very easy to use. They note that the bottle can be inserted and removed with ease, from multiple angles. Reviewers were impressed with the build quality of the cage, although this should perhaps be expected for the price. At £13, this is the joint most expensive cage on the list. This cage might be most suitable for those who are not constrained by a budget, or are especially in need of a light weight cage. Keeping hold of your water bottle is an absolute necessity for any cyclist. Even if you are only going on a short journey, keeping hydrated is very important. To save yourself having to hold onto a bottle for the whole journey, choose one of the above bicycle water bottle cages. Choosing the best bottle cage for you depends on what you need from your cage. If you prioritise keeping the weight down more than anything, consider a light weight plastic or carbon fibre cage. If sturdiness or off road capability is more important, try a heavier metal or plastic cage. Finally, if you need a particular sized cage, there is sure to be one for you. If you choose the right cage for your needs alone, you won’t regret your choice.